I’ve been waiting months for spring break to come. But don’t get me wrong: I wasn’t anticipating a vacation in some sunny resort or a cross-country road trip. No, I was looking forward to attending conventions! Even though I’ve been so busy, I have no regrets. In just six days, I feel like I have grown exponentially and I cannot wait to apply what I learned to both my journalistic and creative writing. For the sake of my readers (if I even have readers), I’ll split my accounts into two posts. Here’s the first. 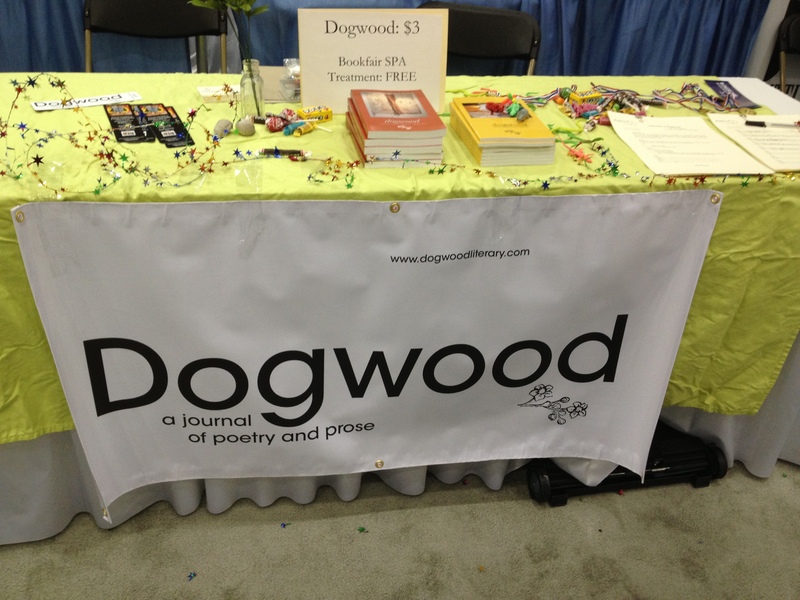 From March 7 to 8, as one of the managing editors of Dogwood: A Journal of Poetry and Prose, I attended my first Association of Writers and Writing Programs convention (AWP). The AWP Conference and Bookfair is the largest literary conference in America with more than 10,000 attendees and 600 bookfair exhibitions. This event is so important that the next four conference dates and locations have already been decided. So, yes, this conference is like a mecca for young and established writers. I’m extremely ashamed to admit that I had just found out about it last semester. Dogwood has been preparing for AWP since then. I have to say, we had an awesome table. I think that we were unique in our approach of luring in interested writers. We offered a spa treatment for the creatively inclined to decorate and to ‘glitterize’ (yes, I just did that) their badges. We had cute animal erasers that a lot of moms picked up for their kids (though I worried about the choking hazards). Then we let them choose between two inspirational quotes: “You are not your author’s bio,” and “You win the awesome award for this year.” I loved hearing the delightful laughs and seeing the smiles of all of the attendees who decided to partake in the treatment. We also had cool bookmarks that we handed out to everyone; I felt proud to see the new typeface that I had helped choose for the upcoming issue, and I cannot wait until the spring issue (April!) comes out. I also think this was a great opportunity to people-watch because writers and editors are just so interesting and eccentric (cue the jokes about writers straying from their natural habitats). You could see the ones trying too hard with their Starbucks, Chuck Taylors, and plaid shirts. I got jealous of the brazen writers who went to every MFA program table and bragged about their working novels or collection. I hope to be as brave as them one day (but also wish for my ego to remain tame). The bookfair had to be split between two floors because so many exhibitors had signed up. I learned that it was okay to get lost because you were bound to find something interesting no matter what. I walked around in awe, astonished to find mags that I absolutely love (Ploughshares, Bomb) and curious about the other mag (Mad Hatter’s Review, Guernica) that I’d never heard of. I packed my awesome AWP tote bag with notebooks, literary journals, magnets, and postcards – so much ‘swag’ that they were happy to give away. You have to know that some exhibitors had come from the West Coast and did not want to lug all of their leftovers back on the plane. There were certain tables that looked empty just because the people running them chose to talk to one another instead of welcoming other attendees. When I approached a few, they’d turn to face me and stare me down as if I was disturbing an important conversation about the weather. Yuck. I stayed away from those tables. On to the nighttime activities. AWP actually sponsored a dance in the Sheraton Hotel and let me tell you: the dance was both awkward and magnificent. Writers usually don’t express themselves through dance; we mostly socialize in our heads (amIright?). I guess the free wine and beer selection encouraged people to come out of their caves. I enjoyed seeing older attendees test their dance moves by swaying their hips and laughing when they realize that they “still got it.” I liked watching the circle of young writers and editors jumping up and down (at times I thought we’d break the dance floor). The DJ played a mix of 90s and current songs, trying to appeal to both groups. I am normally shy when I start dancing but after awhile, I no longer cared. I figured no one would notice my arms failing if everyone else was doing the same thing. Anna, one of the managing editors, definitely had fun – she started the “dancing on the stage” trend and made friends with the DJ (getting his beer once in while). Thank god there was no grinding. The conference had scheduled over 550 readings, lectures, panel discussions, and forums. One thing I wished I had done more was attend the seminars, but unfortunately (but in retrospect, fortunately) I had to leave early for another convention. 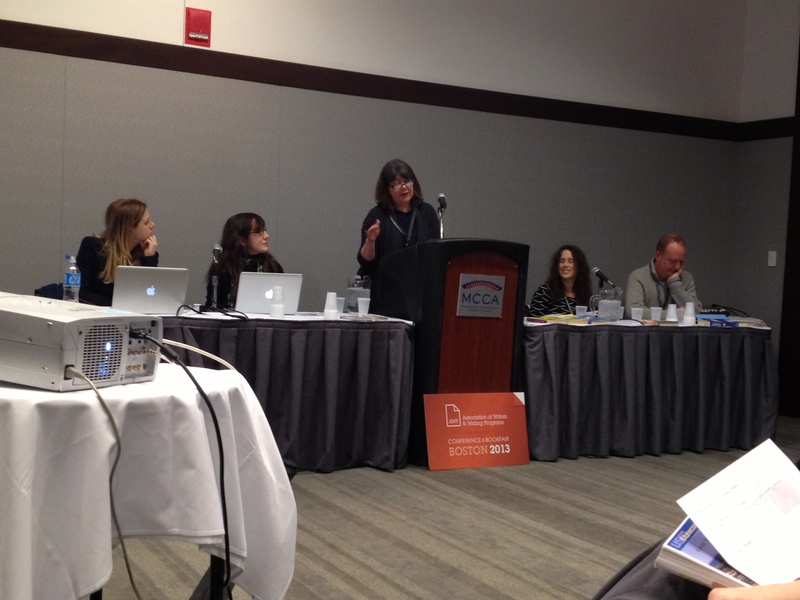 One of the few sessions that I did attend was called “Crossing Boundaries: Landscapes of Childhood and Adolescence,” and the panel discussed the importance of setting in adolescent literature. The panelists argued that the setting is actually the basis for character development. Leading the panel were authors like Australian novelist Lucy Christopher (Stolen) and hilarious Midwestern writer Kerry Madden. I also got to hear them read excerpts from their published and working novels. Afterwards, I realize that Dogwood has a lot of competition and areas in need of improvement. I think that Dogwood needs to be more present online, because in reality that’s where a lot of magazines and journals are going. Perhaps we can update the site more regularly and interact with our readers through social media. Right now, however, I am so proud of what we’ve done so far. We were both lucky and unlucky after the hiatus. We had clean slate and could have messed up, but we didn’t! With the help of willing writers and Dogwood‘s awesome staff from Sonya’s World of Publishing classes, we’ve grown so much. After leaving the convention and on my way to New York, I texted my good friend Esther and said that I had finally found “my people” at this convention. That might sound weird, but honestly, I really felt like I belonged because everyone who attended frenetically pursued writing and reading. Everyone I met saw the importance of writing and the therapy that it could provide. 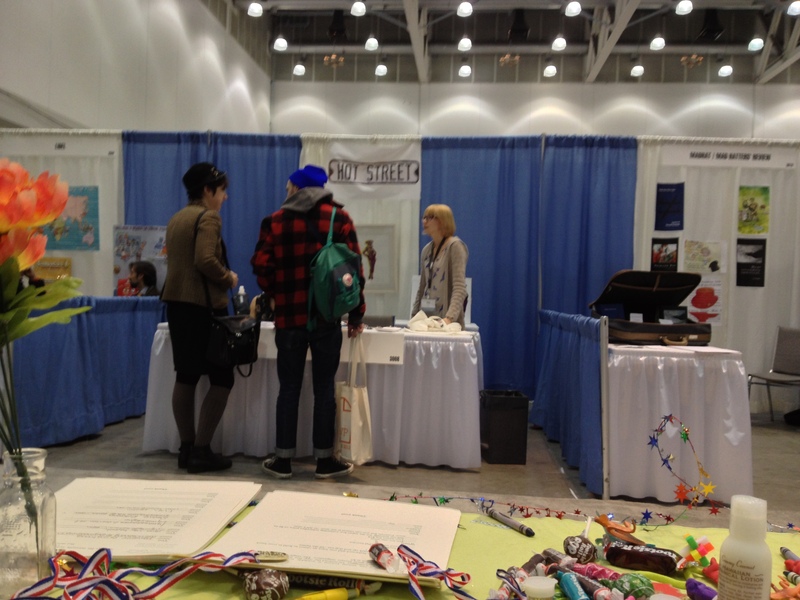 I felt liberated – so much so that describing my feelings towards AWP goes beyond my breadth of vocabulary. In all, what a fantastic experience. I hope to attend another one in the future.